So Christmas is fast approaching, it's by far my favourite time of year. Just like last year, I've started early and already done lots of shopping, I've told myself it's far too early to wrap yet though. 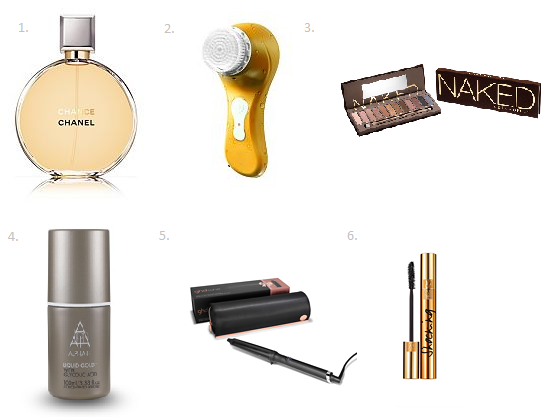 Now that most stores have got the Christmas stock in and ready, I've had a good look around and these are my top picks that I like for beauty gifts. 1. Chanel Chance - A classic fragrance that has been around for years, it's sophisticated and elegant. This fragrance lasts all day and after having a sample of it, I'm definitely lusting after the full size. The bottle is so timeless too. 2. Magnitone Lucid Facial Cleansing Brush - Look at the colour of this! Avaliable in lots of vibrant, you really can't go wrong. For me, this is a purse friendly version of the Clarisonic, at almost a third of the price, it's perfect for any beauty obsessed lady. 5. GHD Creative Curve - So GHD have FINALLY created curling wands, something that's been so highly coveted by pretty much every lady in existence. And I can't wait to try one, as GHD's are my absolute must have hair straightener since the age of 13. (that's ten bloody years) I must get my hands on the creative wand, as it gives just the effect I'm after. 6. YSL Shocking Mascara - I'm currently on the hunt for a new one, a lot of the vloggers around at the moment seem to have this as a staple, which definitely means I need it too. It's not a plastic wand which is something many of us dislike, so I'd definitely be pleased to see this under my tree this year.